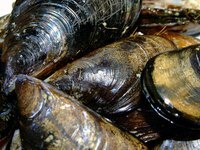 Mussels need to stay alive until you are ready to cook them to ensure that they do not spoil. Storing fresh mussels in your refrigerator with a damp paper towel will prolong the shelf life of the mussels for two days. The mussels will need plenty of open air to breathe, and you will have to remove them from any plastic bags to ensure that they can breathe. Once you prepare and cook the mussels, store them in an airtight container to enjoy later. Tap the shell to ensure that the mussels are alive. If the shells do not close, discard them because they are probably dead. Take the mussels out of the bag once you bring them home. They need room to breathe, and if they do not have enough oxygen, they will suffocate and spoil. Sit the mussels in a colander to give them plenty of air. Sit the colander on top of a bowl to allow the water to drain from the shells. Place the colander with the bowl in the refrigerator. Do not allow the mussels to freeze. You may need to change your refrigerator temperature if it often freezes food easily. Add a wet paper towel over the mussels. This will keep them fresh and living until you are ready to use them. Store cooked mussels in an airtight container. Place them in the freezer until ready to eat. Inspect mussels to see if they are broken, chipped or cracked. Do not buy any mussels that are not alive or damaged.